With over 50 species, Phlox plants are great for a range of situations and vary from low growing ground cover plants to taller species that hold their place in the perennial border. 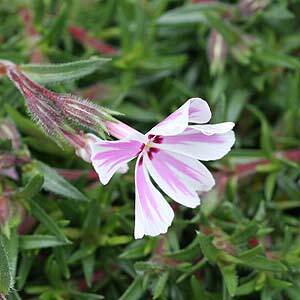 Long flowering and hardy, phlox is a plant that is often overlooked, but is a useful addition to any garden. The scent of the flowers at night when in full bloom is reason enough to grow them in the border. A position where they receive afternoon shade and a re grown in a humus rich moist soil is ideal for most phlox species. Taller species and cultivars may need staking. Most species can be pruned after the first flowering period to promote a second flush of flowers. Aconitum 'Bressingham Spire' , Aconitum carmichaelii 'Wilsonii' and Aconitum 'Blue Sceptre' are all popular cultivars. Phlox subulata (Moss Phlox) is a low growing plant to around 6" a wonderful flowering perennial thats forms a creeping carpet of flowers. Phlox subulata 'Tamaongalei' is a popular cultivar. Phlox stolonifera (Creeping Phlox) is a slightly taller species to around 12' again a creeping plant that spreads by underground stolons. Phlox bifida (Sand Phlox) is also low growing and reaches a little over 6", frost hardy, semi evergreen and carpets of pink flowers in summer to fall. The beautiful mauve to blue flowering Phlox paniculata 'Blue Paradise' . Phlox paniculata 'White Admiral' with its fragrant white flowers. Very easy by division of established clumps, best divided in spring. Also easy by seed.